Step 2: Ring holder (2 F pieces): Stitch rickrack along centre of right fabric side of one F piece. Lay F pieces together, right sides facing. Stitch 1 cm (3/8") from long edges and one narrow end. Step 3: Trim corners diagonally. Turn ring holder right side out. Mark position of snap fastener on closed end. 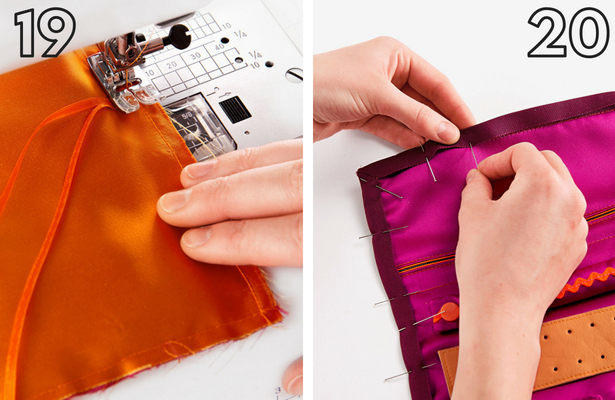 Attach snap, with the help of the pliers. 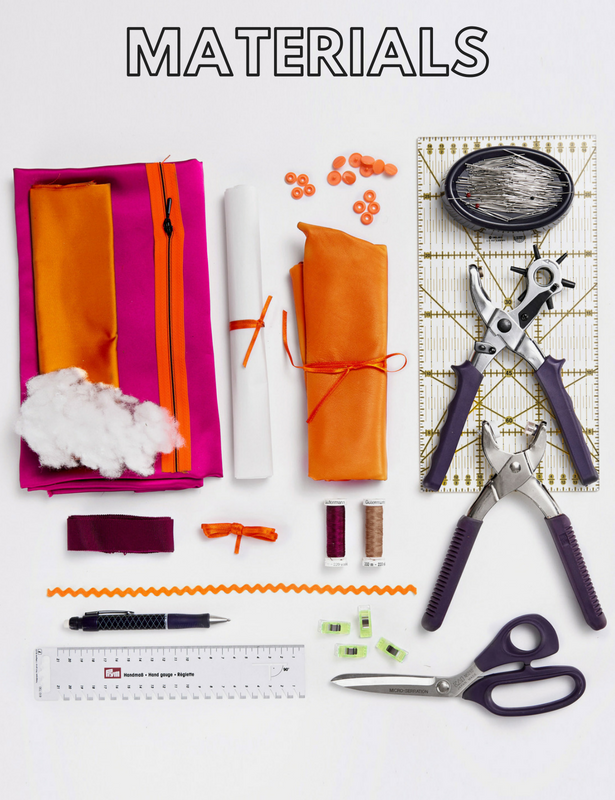 Step 4: Now ﬁll the ring holder with stufﬁng material, using a pencil or knitting needle as a stufﬁng tool. Step 5: First cut piece E (stud earring ﬂap) once from leather. With fusible web, adhere the fabric E piece to the leather piece, wrong sides facing. 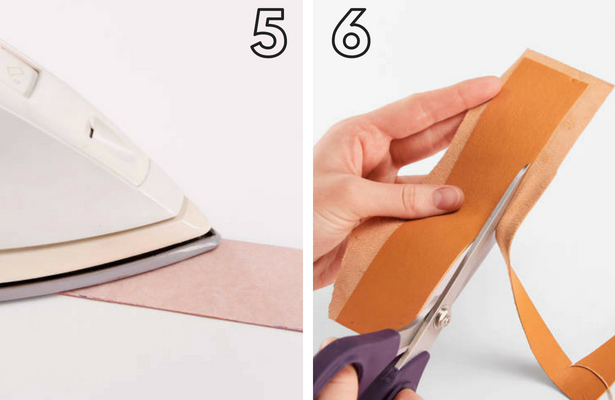 Step 6: Trim leather along fabric edges. Step 7: Topstitch close to all edges of stud earring ﬂap. 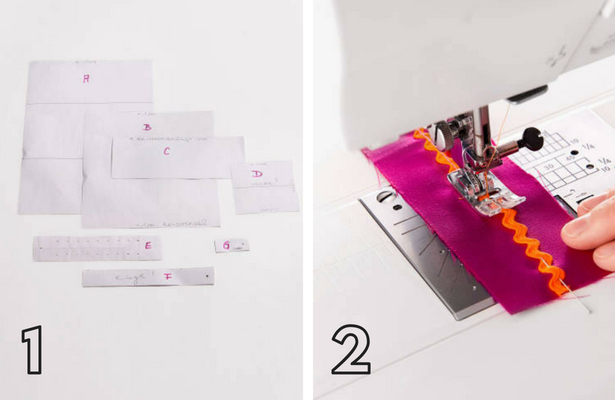 With fusible web, adhere pairs of G pieces (necklace holders) together. Step 9: On stud earring ﬂap, mark positions of holes, with chalk pencil. Punch holes as marked. Attach snap to lower end (as described for Step 3). 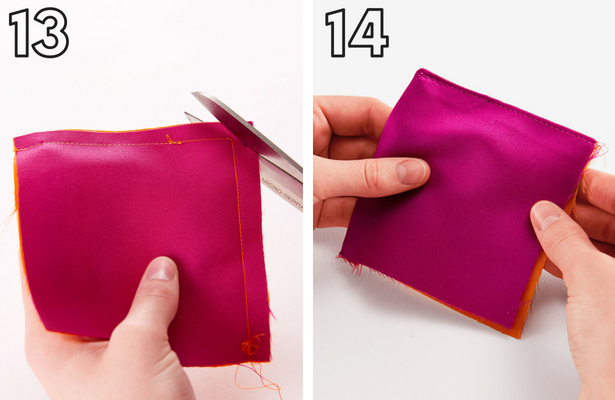 Step 10: On each of fabric pieces B (large inside pocket) and C (zipper pocket) ﬁnish one 21 cm edge, with a serger. Step 11: Press each serged edge to wrong side, 1 cm (3/8") wide. 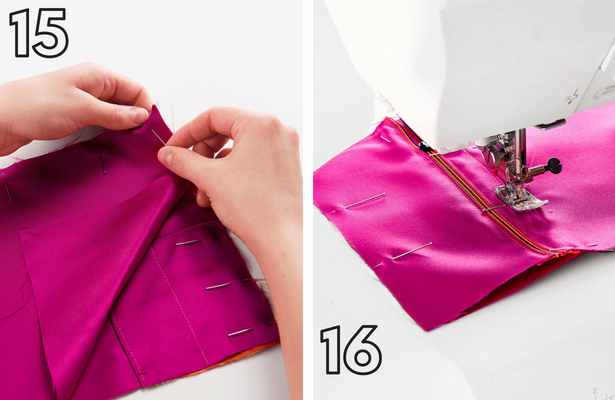 Stitch these fold edges to the zipper tapes. Step 12: Lay pieces D (necklace pocket) together, right sides facing. Stitch 1 cm (3/8") from two edges. Step 13: Trim corner diagonally. Turn right side out. Step 14: Press seamed edges. Topstitch close to one of the seamed edges. Step 15: Lay D on right lower corner of B/C unit, matching raw edges. Edgestitch left seamed edge in place. Stitch along vertical centre. Lay 1 A piece on this edge of B/C, right sides facing. Stitch side edge. Step 16: Turn right side out. Topstitch close to seamed side edge. Now topstitch approx. 2 cm (¾") to right of zipper, as shown, to separate the two pockets. 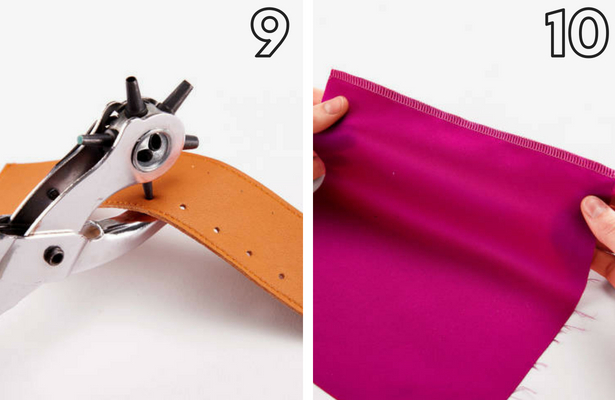 Step 17: Pin or clip pieces E (stud earring ﬂap), F (ring holder), and G (2 necklace holders) to pocket unit, as shown. 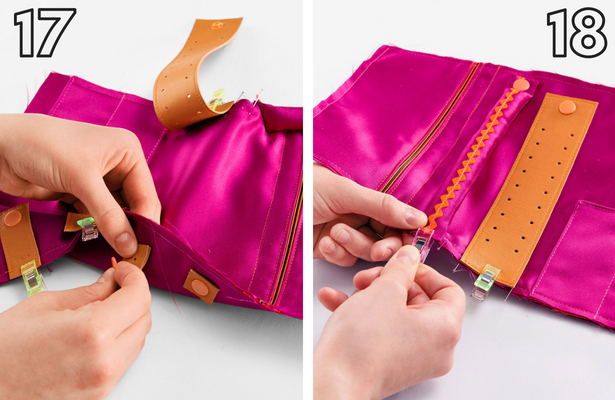 Mark and insert snaps in pocket unit, catching small pieces of leather on wrong side, as reinforcement. 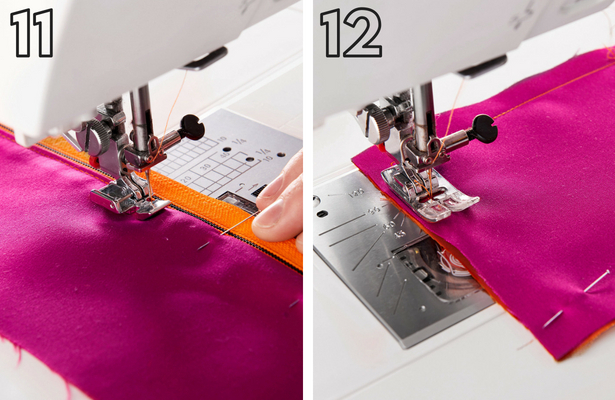 Step 18: Topstitch close to long edges of pocket unit, thereby catching ends of E, F, and G pieces. Step 19: Lay remaining 2 A pieces together, wrong sides facing. Lay inside pocket unit on top, matching raw edges. Stitch close to all edges, catching 2 satin ribbons at center of one narrow edge. Step 20: Finally press petersham ribbon in half lengthwise. Measure lengths of edges between corners. Stitch corners in ribbon. Pin ribbon over all edges and edgestitch in place. FINISHED! This is the perfect case to travel with do you can always find what piece of jewelry you want to wear, and no more loosing earrings in your luggage. 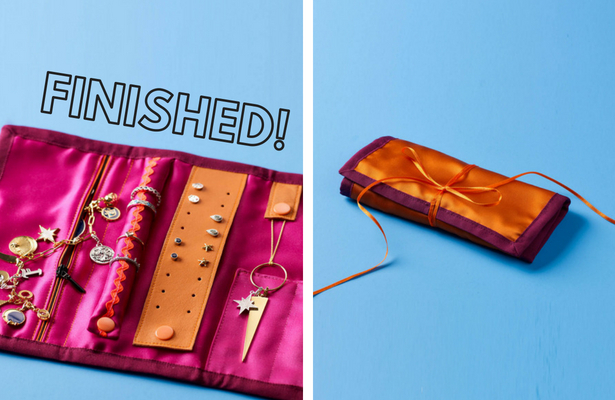 Need some more jewelry to put in this fabric organizer? 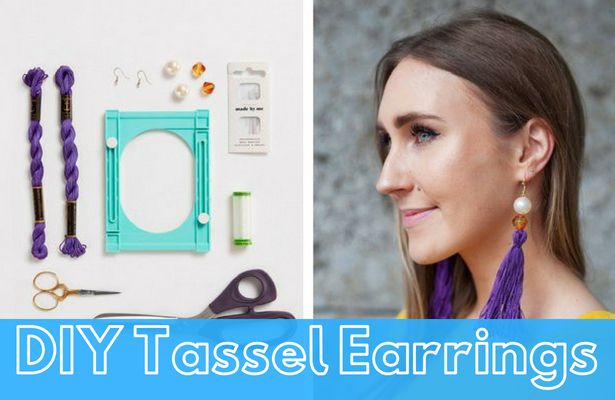 Try making these Tassel Earrings! I have one already (store bought) and it is really useful for traveling. This is so pretty though, I am tempted to make a new one. This is great, but I see no need for petersham ribbon since the trim is mitered instead of rounded. 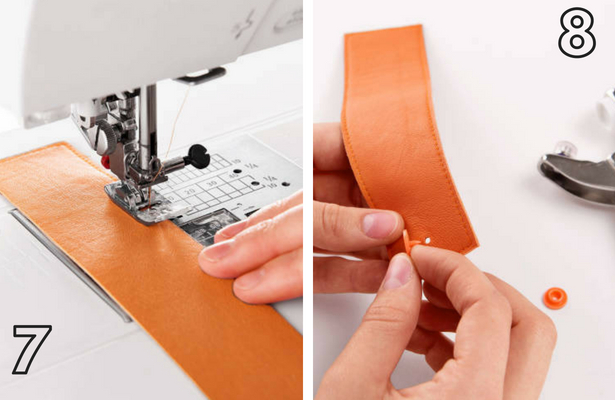 Grosgrain costs much less, comes in many colors and patterns, and does the job perfectly. 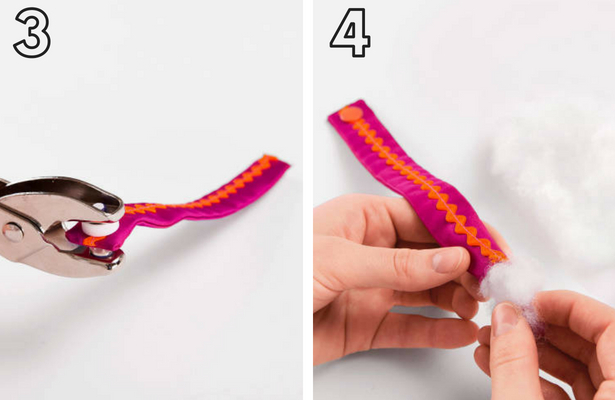 Thanks for this great jewelry roll pattern.